The Benton, Kan., elevator complex. Sometimes while checking out leads about elevators my grandfather was involved with, I’ve made some fascinating side trips. 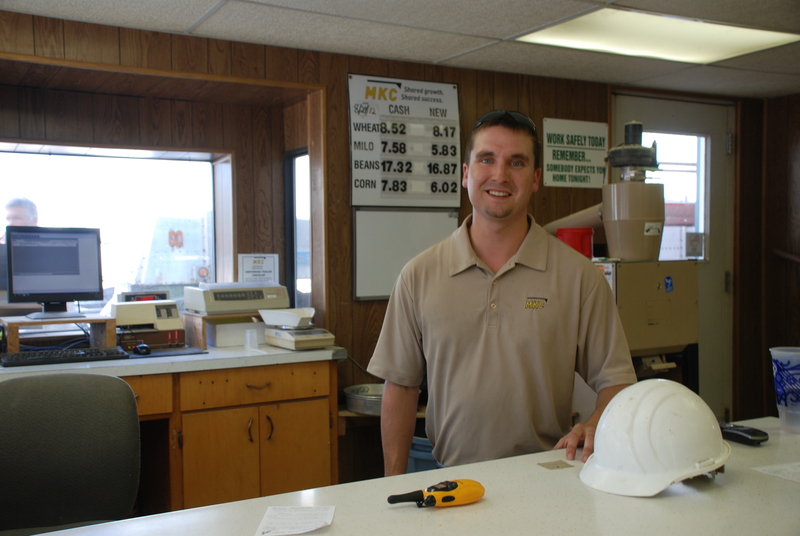 I stopped at a Chalmers and Borton-built elevator in Walton, Kansas, and met the grain manager there, Jeff Snyder. He tipped me off about an operating wooden elevator at Benton, Kansas, also owned and operated by Mid Kansas Co-op, which would make a rare photo opportunity. I made a point to drive up there the next time I had a layover in Wichita. Loading corn for transfer to a larger elevator. 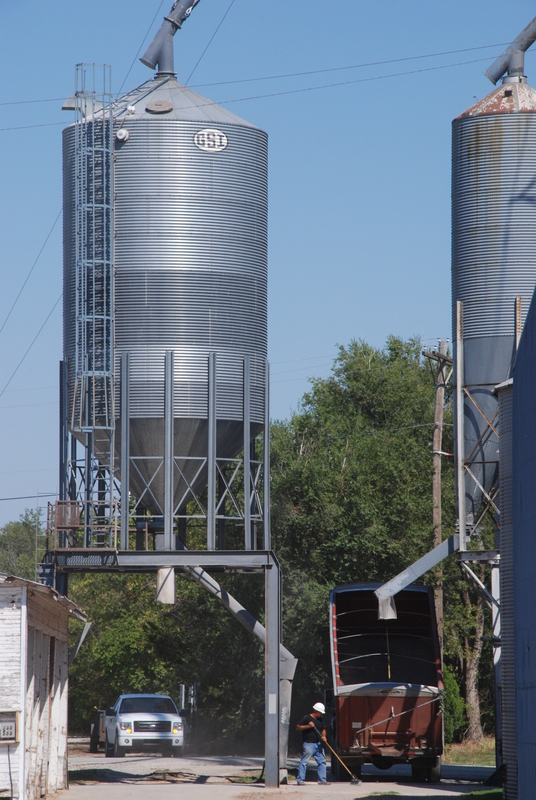 My earlier visit to Traer, Kansas, left me with questions about why cooperatives have come to rely so heavily on metal bins, and why relatively few new concrete elevators are built. The speed of loading and unloading is one limiting factor for elevators. But on my visit to Benton, I was able to gain some insight into other design considerations. 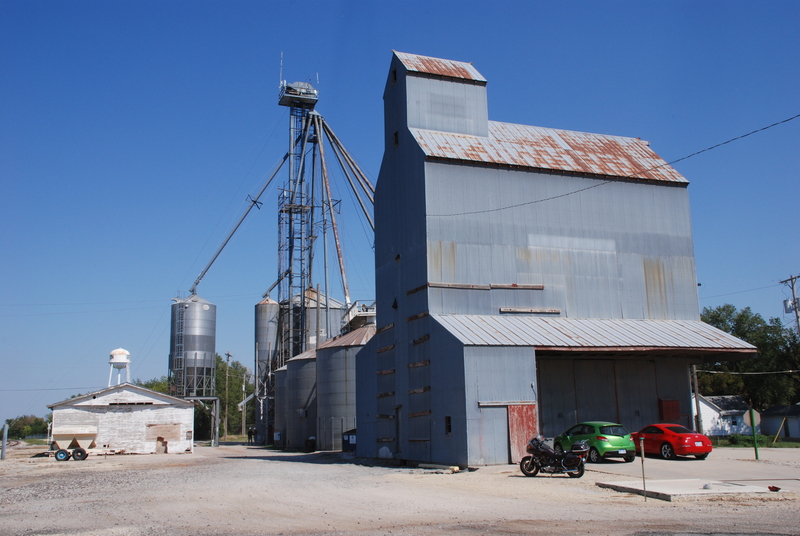 Benton, Kansas, still uses a wooden elevator with metal siding for part of their storage. Beside it, several metal bins make up the rest of their capacity. Harvest was going strong when I stopped by. I saw trucks pull up every few minutes to load corn from a large metal hopper near the grain bins, looping through the scales both before and after filling their trailers. A worker conducting the loading operation noticed me by the railroad tracks with my camera, and during a lull he laconically introduced himself, saying, “Just Christopher will do.” He had a temporary job working for Mid Kansas Co-op during harvest both in Benton and in Wichita at their large concrete elevator, where he became well-versed in elevator operations. Spencer Reams, site manager for Mid Kansas Co-op at Benton, Kan.
Spencer Reams, the site manager, greeted me inside the scale house. 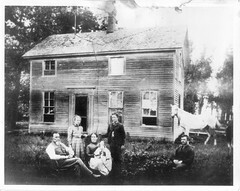 According to Mr. Reams, Benton, Kansas, had a unique problem for a region in the grips of a severe drought. Because of very localized rain at just the right times, the area immediately around Benton had experienced a record harvest, up to five percent over any previous harvest. So the elevator was completely full of corn while the milo and bean harvest was underway. 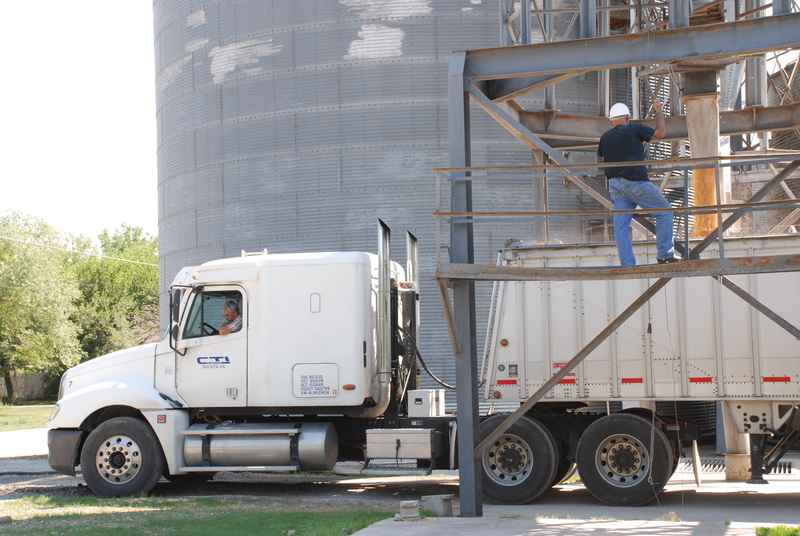 Grain trucks were called in to move the corn to the cooperative’s larger Wichita elevator to make room, as Christopher explained. While I watched, an old farm truck full of milo pulled in to unload into the pit. Meanwhile the grain trucks, once they were loaded with corn and weighed, made the nine-mile trip into Wichita and then returned for more, waiting for the loading hopper to fill before filling up. A truck dumps milo into the pit where a conveyor would take it to the leg, out of the photo behind a bin on the right. The loading hopper is to the left. Christopher told me what he thought of the various types of elevators. He said that he preferred the metal bins–they were easier to work around. He showed me a photo of the man-lift that was used in the Wichita concrete elevator, and I agreed that it looked like a harrowing ride. A simple ladder on the side of a metal bin seemed safer. Also, older concrete elevators were crumbling, he said. For one thing, during freezing temperatures, trapped moisture could cause the concrete to crack and flake. It could be patched, but much like a road bed, eventually the elevator would become unserviceable and unsafe. Though he did not comment on Benton’s wooden elevator, it was apparent that for various reasons these wooden structures were becoming harder to keep within regulatory bounds. It is very remarkable, in fact, to see one still in operation. Each storage facility apparently has its advantages and drawbacks. One of the chief advantages of an elevator is its existence–if it is standing and in any way serviceable, it will be used. Its life ends when it can no longer keep up with demand, and when it becomes cheaper to build a new one than to repair or upgrade an old one. So each year more of the old landmarks go missing, to be replaced by the plain and common metal bin. This entry was posted in Their Work and tagged architecture, Business, grain elevator, Kansas, slip-formed concrete, Wichita.